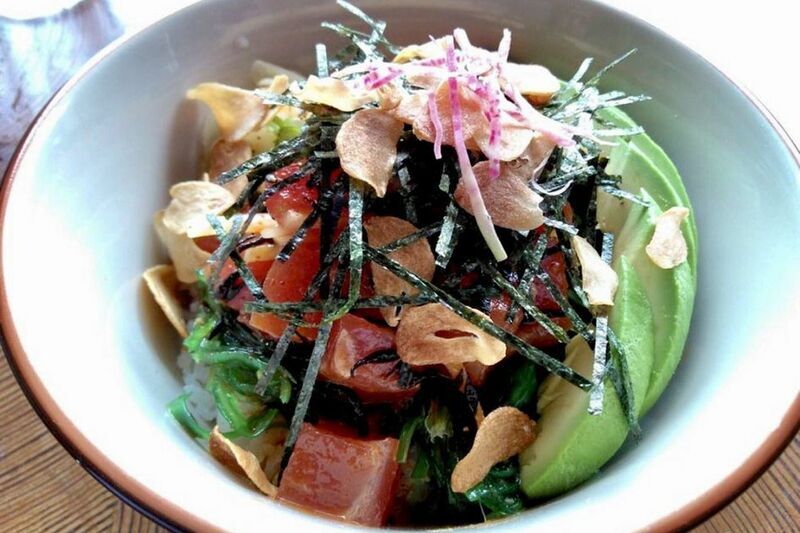 Goma bigeye tuna poke at Nom Nom Bowl. Alan Su expands his string of Japanese eateries Thursday as he and a partner soft-open Nom Nom Bowl, a fast-casual spot focused on ramen, sushi, and combinations thereof at 1608 Sansom St., which last housed Seattle Teriyaki. It’s a smaller offshoot of Nom Nom Bowl in University City. Su and chef Jay Niyma (ex-Neta NYC, Blue Ribbon) are offering rice bowls, salad bowls, Bak buns, and mazeman (mixed noodles with various proteins, including ribeye steak, miso cod, roasted chicken with onsen tomago, and pork toroniku). Ice cream buns sandwiched between dokoyaki are on the way for dessert. The soft-opening menu of Nom Nom Bowl, 1608 Sansom St.
For now, Nom Nom Bowl is open for lunch only and is accepting cash only. Su got into the business in 2012 with Nom Nom Ramen near Rittenhouse Square and has since expanded to own stakes in Yamitsuki, Aki Nom Nom, and Nom Nom Bowl.